In this picture, my daughter is not yet walking or even crawling. Within a year she would be and then the fun began. As soon as I’d get on the phone, she raced off to get into as much trouble as she could. Her specialty was climbing up on the kitchen table, then walking off it. My sister called three times in a row and each call ended with a screaming and crying child on my end. I finally told my sister I’d talk to her some other time, put my daughter in the corner, and took a time-out for myself. I was so mad at her! She was quite the monkey girl, climbing onto and into everything that she could. As an adult, she’s still adventurous. Thankfully though, she is better at judging the risks and being more careful about danger. Word for tomorrow – WITCH. If you prefer to work ahead, see the list for the week under “A Word A Day”. I remember that green model of rotary phone. I can picture it sitting on my uncle’s desk in the house I grew up in — hard wired to the wall. 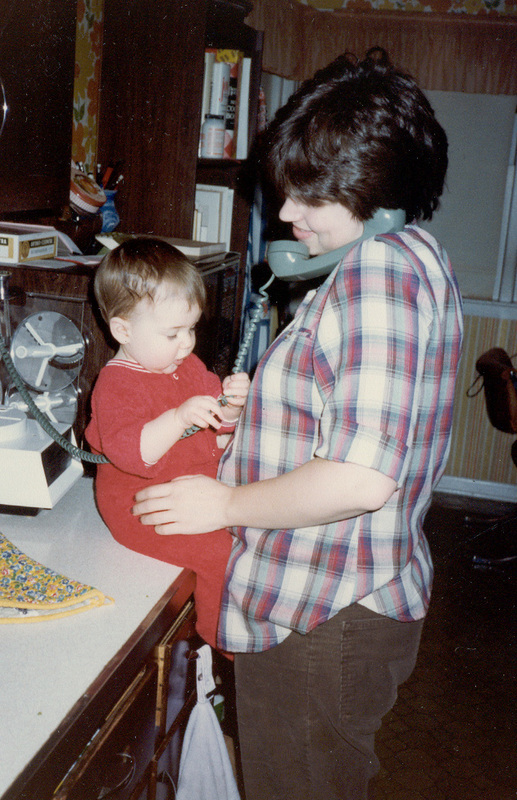 “We have come a long way baby” it terms of the phones we use– and your baby has come a long way to.